Give the gift of DESSERT! Named the "Best Mail Order Pecan Pie America Has to Offer", this pie which is made from scratch is filled with a mound of southern pecans, and delicious filling. 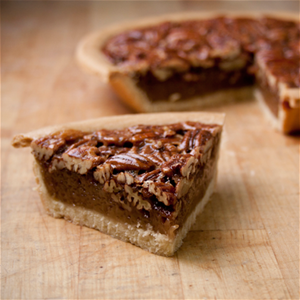 The pecans float to the top, creating a delicious and crunchy top to their ooey, gooey pie. The pie is non-dairy and kosher and makes a great gift for the holidays to share! Give the gift of delicious POPCORN!! Annie B’s tin of popcorn is an elegantly packaged gift, the two-gallon silver tin holds enough popcorn to feed a crowd! Every tin of popcorn is handcrafted, packaged and shipped the same day for the ultimate in freshness. 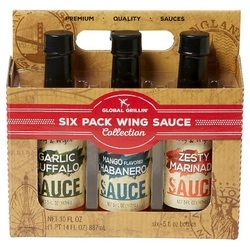 They come in a variety of flavors such as Sharp Cheddar, Jalapeno Cheddar, Sea Salt Caramel, Original Caramel and more! Annie B’s popcorn is gluten-free, made with non-GMO popcorn and is handcrafted in small batches in their nut-free facility. Vermont Smoke & Cure has been crating delicious smoked meats and meat snacks since 1962. They use simple local ingredients like Vermont maple syrup and apple cider, combined with the highest quality spices and herbs like tamarind and quarter crack pepper with their meats. They have a wide selection of meat varieties and flavors. Their Meat Sticks Sampler has three each of their most popular flavors that include BBQ, Chipotle, Cracked Pepper, Honey Mustard Uncured Pepperoni and Ancho Pepper. It makes the perfect gift to give (and receive)! Give a gift that they will CHERISH! Are you looking for a gift that surprises, delights and moves your recipient to tears? AwesomeBox is an entirely new way to give a truly memorable surprise gift that he or she will cherish forever! Easily curate personal memories, stories and photos of your loved ones, and package them into an eye-catching one-of-a-kind gift that will have them smiling, crying and laughing! You can also invite friends to help you create the AwesomeBox for your loved one by having them share pictures or messages. 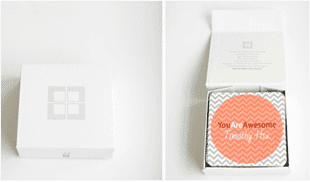 Once you have uploaded your pictures (you select the number of cards) and messages online the cards and memory box is created and mailed directly to the recipient! So show your loved one how "awesome" they are with an AwesomeBox! Give a gift of CLEANLINESS! Give the gift of CONVENIENCE! The Great Plate is perfect for wherever food and drinks are served together. With one hand you can enjoy your food without leaving your drink. Frees up your hands to eat and drink. The plates are perfect for tailgating, picnics, parties, lunches, poolside, sporting events, buffets and more! They are made of flexible and durable dishwasher safe FDA virgin resin polypropylene and are both recyclable and reusable! The HoMedics® Quad Shiatsu Massage Cushion with Heat is your personal masseuse. With three massage styles and zone control, this massage cushion puts you in control of your massage experience. Buy a gift of MEMORIES. Preserve your recorded memories digitally. 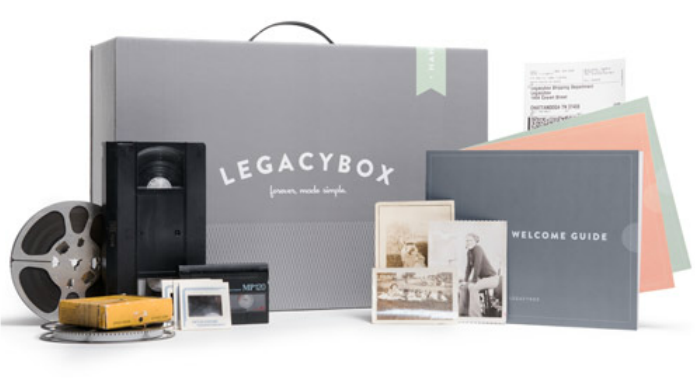 Fill LegacyBox with your memories and send it to them. In just a few weeks, they will send it back with all of your precious moments digitally preserved on DVDs. Buy a gift of HEALTH. Designed elegantly to fit in kids and adults hands, the Connected Bluetooth Toothbrush weighs less than 2.5 oz! Electric toothbrush Dramatically Reduces Plaque and uses gentle Sonic Vibrations to not harm sensitive gums. Easy set up with recharge base included. Give the gift of a BRILLIANT SMILE! 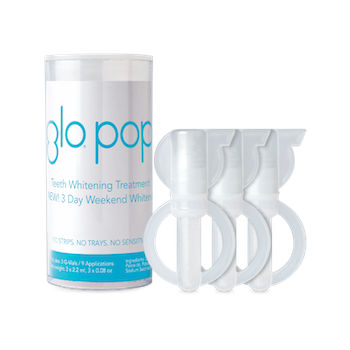 GLO POP's 3 Day Weekend Whitener is a fast and efficient way to a brighter smile! The treatment contains 3 G-Vials for three days of whitening or 9 applications. The foaming action instantly whitens teeth and freshens breath! There are no strips, trays or sensitivity! Buy a gift of RELAXATION! 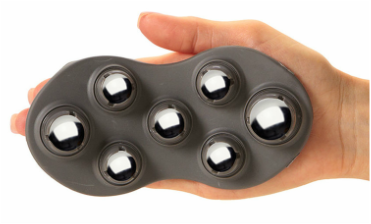 Relieve sore, tired muscles like a pro with the Moji Mini Pro Massager. Buy a gift of CHARM! Always losing your wine glass at parties? Identify your stemware with a metal international charm from Trudeau. Each of the six wine charms represent wine producing countries. Soft backing prevents scratching on your stemware. Give the Gift of CLEANSING! 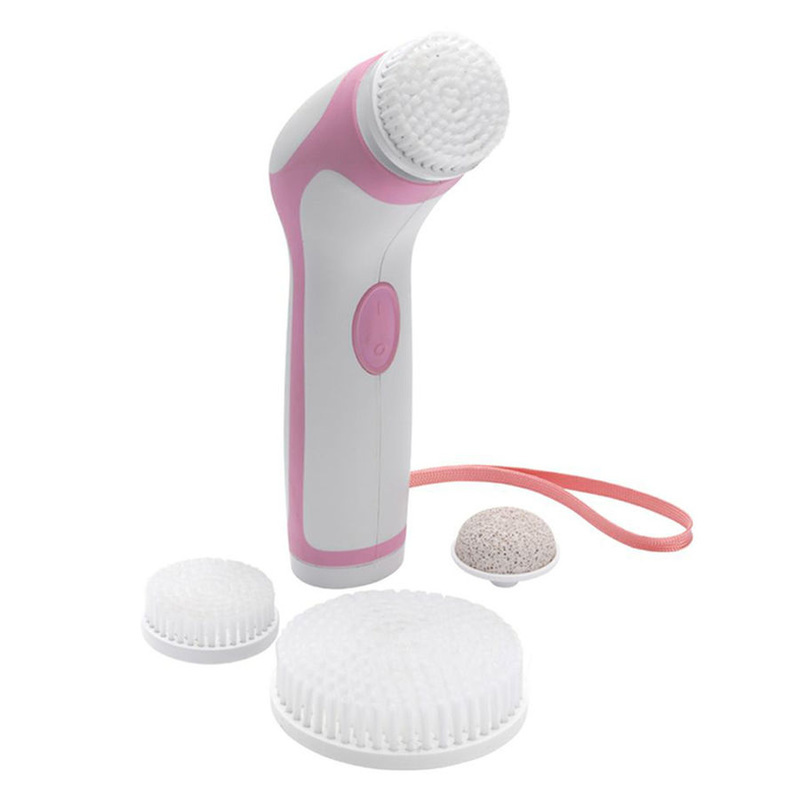 ​This Professional Skin Care Face Brush System by ToiletTree™ Products is an advanced daily cleansing tool that helps polish away dull skin and gently exfoliates away impurities that traditional cleansing leaves behind. The result? Wonderfully cleaner, softer, radiant looking skin. Give the Gift of CHOCOLATE! 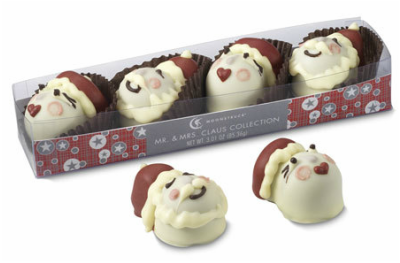 ​Santa is back this year with his sweet misses, making this four-piece his and hers set complete! Featuring a milk chocolate toffee and classic milk chocolate ganache, hand-made from start to finish, this collection has something for the whole family! 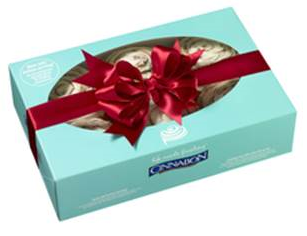 Perfect as a hostess gift, to serve at your own holiday party or for your friend with a sweet tooth, Cinnabon packs are the ultimate way to bring the irresistible aroma and taste of Cinnabon bakeries home! Baked and packed fresh all-day, every day, Cinnabon packs are offers in the Classic Roll variety in both the MiniBon and Classic Roll size or in Caramel Pecan. They make a wonderful treat to give (or keep)! In creating this unique blend, HALL Napa Valley realized the great potential of their vineyard sources in St. Helena. Unique for its gravelly, low vigor soils and cooling influence of Pacific breezes, the fruit in this region produces a stylistically lush, aromatic wine with a dense core of dark briar fruit. Exuberant aromas of blackberry, cassis, cola and red fruit. The palate is opulent with a harmonious balance of fruit, oak and tannin carrying through the long finish. Kimmel Vineyards is based in Potter Valley, Mendocino, CA and has a wide selection of great wines. We love the Four Blocks Collection which includes a Chardonnay, Merlot, Cabernet Sauvignon and a Redessence. ​This family owned and operated vineyard provide quality wine at excellent prices. The Collection makes a wonderful gift! Give the gift of DELICIOUS COCKTAILS! The set comes in the perfect gift crate with a cocktail shaker! Give the gift of PEPPERMINT! This flavor of Pinnacle vodka opens with a cool burst of mint and finishes with subtle notes of creamy chocolate! It makes a perfect drink when you add a splash of cocoa! There are so many possibilities and the perfect gift to give or receive! 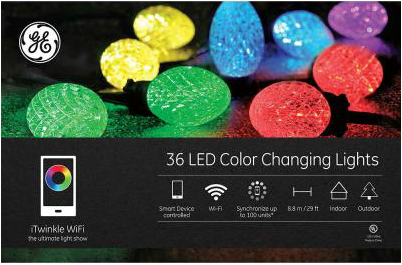 GE iTwinkle wifi G35 36-Light Color Changing LED light set. Personalized light show at your touch for use with all iOS and Android devices APP includes multiple light + musical shows and additional features including myColor technology. 18 in. lead wire, 10 in. lamp spacing, 29.1 ft. lighted length, 30.6 ft. total set length. Give the PERFECT Stocking Stuffer! Green Goo® is Nature's best first aid tool for all your basic injuries and immediate skin repair. Known as the BEST herbal salve out there to reduce itching and inflammation of mosquito bites! The Green Goo® formula is enriched with a high concentration of antibacterial and antiseptic herbs designed to help repair and heal wounds. This product is known to be a natural alternative to Neosporin ® and Hydrocortisone creams and replaces 20 first aid products! Additionally, Green Goo® provides natural lubrication to soothe chafing from sports such as biking, hiking, climbing and water sports. 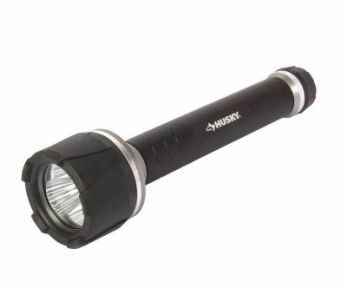 Give the gift of PREPAREDNESS! The Essentials Deluxe by resqme, Inc. includes 124 must-have emergency items, stored in a premium fabric case with detachable and water resistant PVC plastic pouches. Includes 1 resqme -The Original Keychain Car Escape Tool. Products in the kit include band aids, emergency blanket, flashlight and more. Give the gift that keeps your beverages warm or cold! 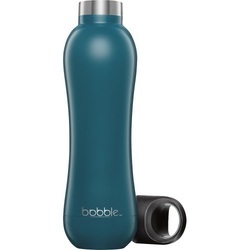 bobble Insulate is a high-grade, stainless steel drinking vessel that keeps beverages hot for up to 12 hours or cold for up to 24 hours. The new product line incorporates bobble’s iconic shape and style, with the addition of double-wall vacuum insulation technology for superior heat and cold retention. The BPA-free, dishwasher-safe bottle will not sweat and features a leak-proof seal. bobble Insulate is available in a range of six colors and makes a great gift! Give the gift of luxurious bath products! A classic gift reinvented for that fruit fanatic in your life who isn't quite skilled with a kitchen knife. These fresh picked scents will brighten any shower experience. Experience the luxurious lather of Vitabath's gently cleansing Sulfate and Paraben Free body wash formula. It leaves your skin feeling clean, refreshed, and vibrant! This fresh Fruit Basket Bundle includes: Raspberry Vanilla Velvet™ Body Wash, Pineapple Sunset™ Body Wash, Wild Red Cherry Body Wash, Pomegranate and Blood Orange Body Wash, Grapefruit Vanilla Body Washes and Lime Citron Basil™. Vitabath® Body Washes are formulated with antioxidant rich super fruit blend of Acai, Goji, Coffee, Noni, Pomegranate, Green Tea and Mangosteen. They also include vitamins A, B3, C, E and Pro-Vitamin B5. Give the gift of Moisturization! 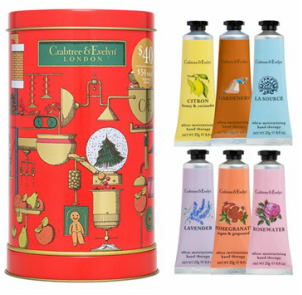 Crabtree & Evelyn presents a hand-pampering collection of six of the brand's Ultra-Moisturizing Hand Therapy creams in fragrant scents, beautifully arranged in a musical, wind-up tin that plays "Frosty the Snowman." Delightfully cleanse, soften and soothe hands with natural herbs from our enchanting garden. Our full-size Gardeners Hand Soap and Gardeners Hand Therapy are perfectly paired in a festive box, a refreshing treat ready for gifting. Give the gift of RESTFUL Sleep! 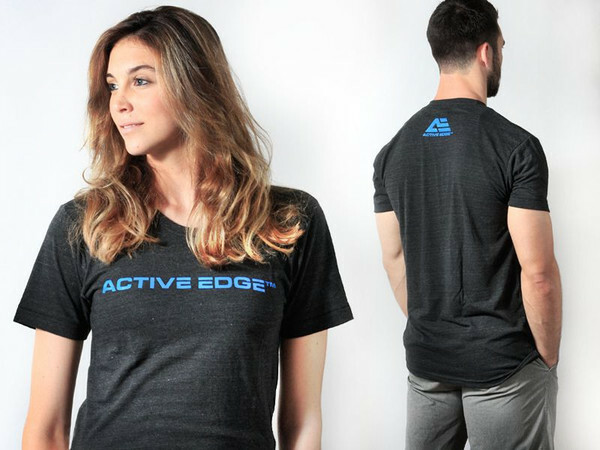 Active Edge™ is the first technology capable of infusing and embedding a recipe of electromagnetic frequencies into fabrics and other materials. When an Active Edge™ product comes into close proximity with the body, it activates the sympathetic nervous system. This increases blood flow and oxygen intake, while at the same time decreases inflammation, which all helps the body to perform at a more optimal level. The Active Edge Sleep Shirt is embedded with technology to help fight inflammation & pain, improve sleep & help the body perform at a more optimal level. The shirt is extremely comfortable and can be used for sleeping or even for working out! 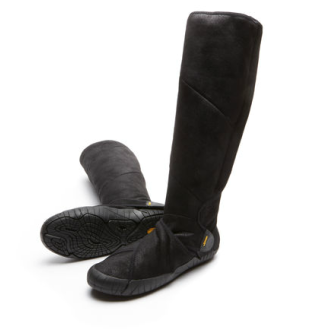 Vibram's latest addition to the Furoshiki Collection is their new unisex shearling boot! They provide added comfort and warmth to the wrapping sole concept, offering a luxurious, snug fit for hanging out around the home or traveling out and about! For the everyday person on the go, this latest innovation lets you escape those big, bulky boots! With the Vibram sole you know that they are built to last. The synthetic shearling lining provides an added softness and comfort against the leg and makes the perfect gift for a loved one! Give a unique card with your holiday gift! PAPYRUS offers an extensive collection of greeting cards, including classic, modern pop-ups, lenticulars, and laser-cut designs. PAPYRUS knows how to celebrate every occasion and has a excellent selection of Holiday greeting cards. Papyrus' handmade greeting cards always has the right words to say and looks beautiful while expressing sweet sentiments. Their comprehensive collection is made up of the most unique greeting cards which is perfect for holiday gift giving! Give the gift of SPICE! Give a DELICIOUS gift for the Holidays! Looking for a delicious gift that keeps giving? Check out the line of Chips and Sprinkles from Target! 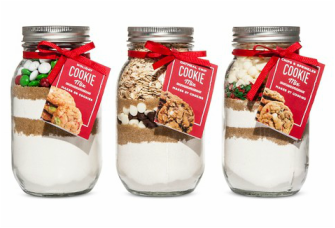 They have a range of beautifully packaged cookie mixes that suits every taste! They come in clear mason jars so you can see the colorful baking ingredients. This makes a cute gift for someone that loves to bake! Give the gift of Christmas Cocktails! 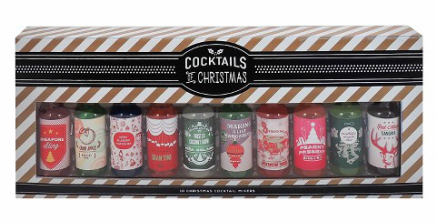 Target has just launched a special collection of Christmas Cocktail Mix Sets! This is the perfect gift to bring holiday party hosts or to give to cocktail connoisseurs! This ten-piece collection includes cocktail favorites with a Holiday twist such as "Peach Present" Bellini Mix, Red Nose Sangria and more! 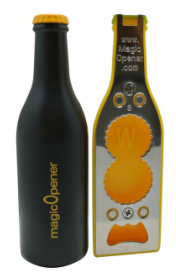 The Extreme magic Opener opens the most difficult bottles to open like water bottles, plastic soda bottles, aluminum soda cans, pull-tab soup cans, traditional glass bottles and many more! Extreme is ready to open the most common FOUR sizes of plastic bottle caps, without any assembly. This is one of the most useful gifts to give this Holiday Season!